Eggs baked in portobello mushrooms are lovely for brunch and substantial enough for a filling lunch or a meatless dinner. Portobello eggs are a gorgeous, healthy, and filling dish. I make them quite often because everyone always raves about them. I really love portobello mushrooms. Much like eggplants, they give a vegetarian experience that’s very meaty! They are substantial, nourishing and very healthy. It’s a truly easy recipe. Scroll down to the recipe card for the details. But you simply broil portobello mushrooms, then break an egg into each mushroom cap, and bake until egg whites are set. The mushrooms are the stars of the show here, so choose them well – it’s best to use large, firm portobello mushrooms, that are not too flat (or the egg will spill) nor too deep (or the egg will take forever to cook). 1. Wipe clean, don’t wash them (they absorb water). 2. Remove the gills. They tend to release a lot of liquid (I admit to not always doing this!). 3. Pre-broil to release some of the water. 4. In the final stage of baking, bake just until the egg whites are cooked. Baking too long will result in mushy mushrooms that have released their liquid into the eggs. But even if that happens, do not despair: carefully drain the liquid, and place the mushrooms on paper towels to soak as much of the liquid as you can. Eggs baked in portobello mushrooms make a fun weekend breakfast, a great lunch, or a filling meatless dinner when served with a salad or some steamed veggies. When I make them for dinner, I often serve them with a simple side of cherry tomato salad. This makes for a healthy and colorful meal. I believe that portobello baked eggs are very healthy. Mushrooms have many health benefits, and eggs are a superfood. This is one meal that I feel good about serving to my family! 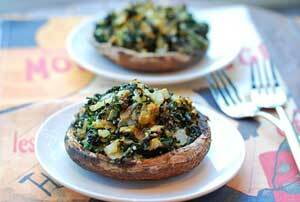 If you love meaty, flavorful portobello mushrooms as much as I do, you will also like these delicious spinach-stuffed mushrooms. 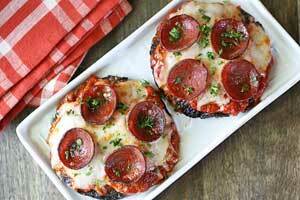 And these simply grilled portobello mushrooms are one of my favorite side dishes. Portobello eggs are lovely for brunch and substantial enough for a filling lunch or a meatless dinner. Preheat broiler, setting the temperature to high. Set an oven rack in the middle of the oven. Line a baking sheet with foil. Spray the mushroom caps with olive oil cooking spray on both sides. Sprinkle with 1/4 teaspoon kosher salt, 1/8 teaspoon pepper, and 1/4 teaspoon garlic powder. Broil 5 minutes on each side, or until just tender. Remove the mushrooms from the oven. Drain any liquids. Switch oven from broil to bake, setting the temperature to 400 degrees F.
Break an egg into each mushroom. Sprinkle with the cheese. Bake 15 minutes, until the egg whites are cooked. Sprinkle the eggs with the remaining 1/4 teaspoon salt and 1/8 teaspoon pepper. Garnish with parsley and serve.